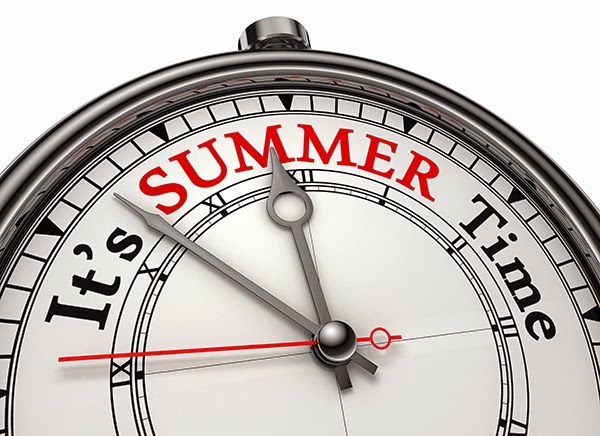 Constantly consumed by numerous unsuccessful attempts at securing a new employer (and trying to end a 6-month long jobless stretch), I haven't had a chance to really enjoy the promise of relaxation that the summer season brings around this time every year. Since I finished my journalism program last December (and receiving my certificate the following month), this is the first one since 2011 that I do not have any schoolwork to work on so I have been occupying some of my limited "down" time with entertainment and activities related to that field. The items that I already posted here (the Clinton booksigning, the Dayton festival) might have been the only the things I considered "newsworthy" but there has been much more going on related to past, present and even fictional news. 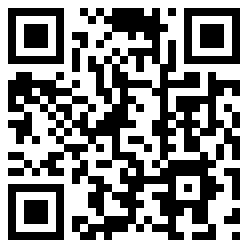 Over the next few weeks, I will provide these observations in a chronologically ordered, multi-part series. The first installment deals below with one of a journalist's greatest fears--being jailed for simply doing your job (or, in this case, being convicted on trumped-up charges). Since late last year, three journalists who work for the Qatar-based satellite television network have been detained by Egypt's government in the wake of the military's overthrow of the Muslim Brotherhood regime that replaced the decades-old regime of former president Hosni Mubarek back in the "Arab Spring"-related activities in 2011. That pan-Islamic political party had won the parliamentary elections in that democracy deficient nation in 2011 and a razor-thin presidential election victory by Mohamed Morsi in 2012. Since the overthrow of King Farouk in a 1952 revolution, Egypt has been controlled by "strong man" leaders starting with Gamal Abdel Nasser in 1954, Anwar Sadat in 1970, and Mubarek in 1981 (taking over in the wake of his predecessor's assassination by Muslim extremists from within Egypt's military). Those 2011 and 2012 ballot box victories were initially allowed by the country's military leadership--the true "power brokers"--but the Muslim Brotherhood's pursuit of their religion-based platform (Sharia law, suppression of anticipated civilian freedoms) caused huge uprisings among the overall population and led to the eventual ouster of that government by the military in the summer of 2013. During that overthrow and the subsequent crackdown on Muslim Brotherhood supporters, Al Jazeera was thought to be overly sympathetic to their cause and their in-country offices were closed in September 2013 (they had a similar claim made against them during the initial 2011 uprisings against Mubarek and had six journalists detained and equipment seized for a short period). In late December, Fahmy, Greste and Mohamed were arrested in a Cairo hotel on charges of aiding a terrorist organization by broadcasting false news in the service of that blacklisted party. Their trial, which began in February and ended with their convictions on June 23rd, was almost universally condemned as a farce by international journalism organizations and human rights groups. The prosecution's bizarre evidence against the trio included a music video by the French pop artist Gotye, one of the defendants' own vacation pictures from areas outside of Egypt, and video footage of sheep farming to somehow demonstrate complicity or linkage with that outlawed group. 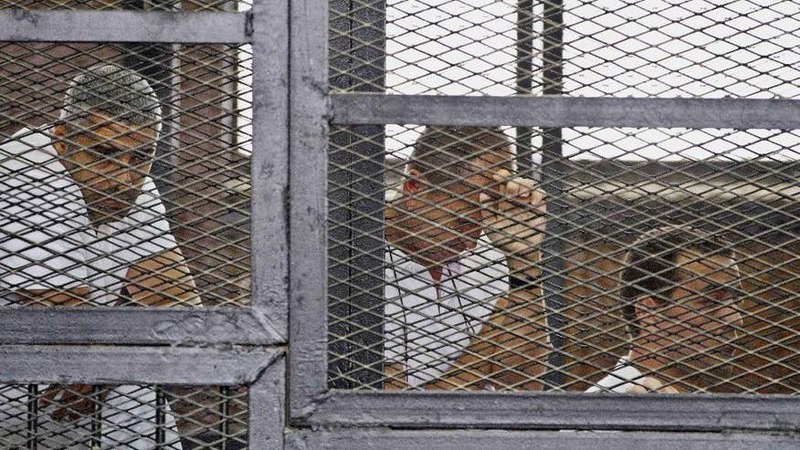 When the sentences were rendered, both Fahmy and Greste received 7-year terms (Mohamed got an additional three years because he was found in possession of a spent bullet casing he picked up off the ground at a protest rally). Egypt's newly elected "civilian" president (and, until very recently, the commander-in-chief of the military and the defense minister) Abdel Fattah al-Sisi said that he would allow those verdicts to stand and not pardon the journalists, despite the international condemnation of the court's conduct or the severity associated with those offenses. 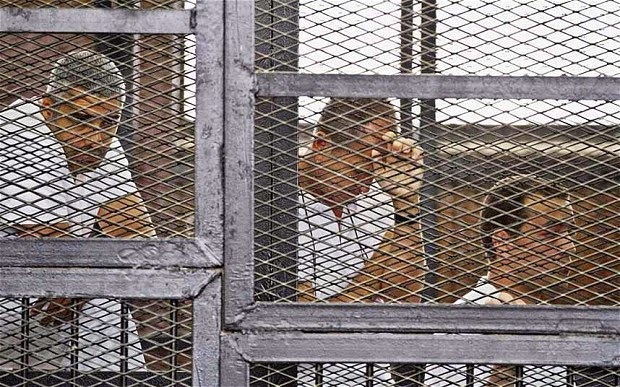 It appears that without al Sisi's help, the trio will now have to navigate their way through the Egyptian judicial system to overturn that decision and reports have Greste starting that formal appeals process yesterday (Fahmy's brother is uncertain about his jailed sibling's decision to appeal the "ridiculous verdict"). Back at the beginning of their trial, the Al Jazeera networks began an aggressive proactive social media campaign to bring attention to the plight of their incarcerated employees. 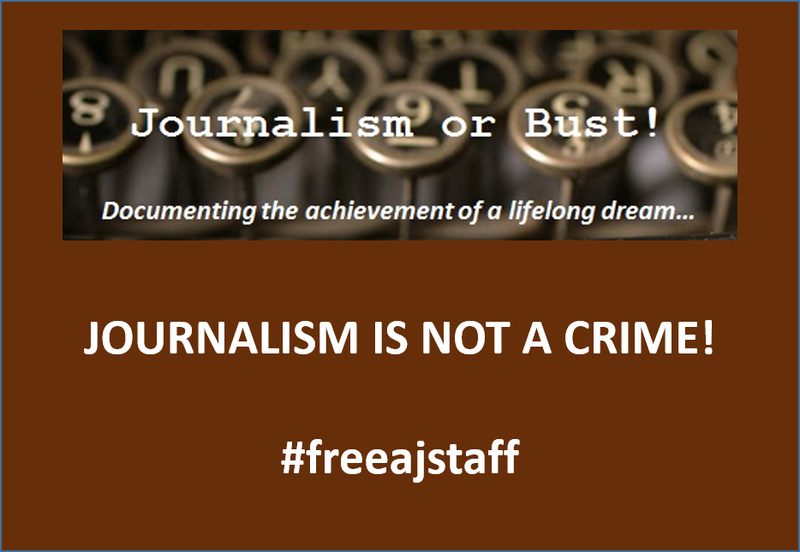 The hashtagged phrase #freeajstaff corresponded to a "Journalists Under Fire" initiative used to spotlight the dangers practitioners of that profession face on a daily basis in the world's most dangerous locations. In late February, I made a graphic and posted it on this blog's mainpage to demonstrate my solidarity with them and it will remain there until all three of them have been released. Next up in the series...how about a new television program that involves a familiar face from a "fake news" show?